Asha attended Chethams school of music where she studied Cello under David Smith and Jazz piano. 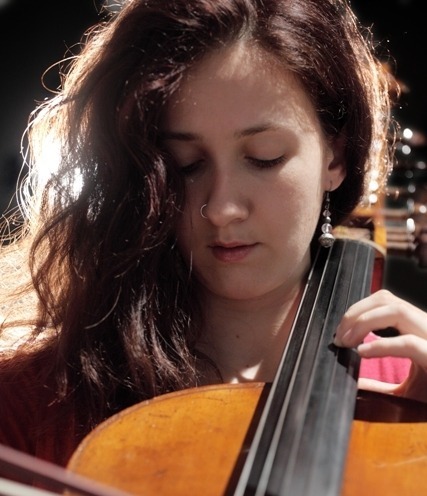 She was lead cellist of the National Youth Sinfonia (2002-2006), and has played solo, quartet and orchestra concerts of Western Classical music in venues such as Royal Festival Hall, Queen Elizabeth Hall and Bridgewater Hall. She has a music performance degree from Dartington College of Arts. Since 2006, she has collaborated with musicians from many genres from Jazz funk to Zimbabwean mbira music, and played at diverse venues such as Glastonbury festival (UK), Sunburn Festival (Goa) with DJ Jittter, India Habitat Centre (Delhi) with Neel Murgai Ensemble, Ronnie Scotts (London) with Carrie Tree band, etc. She enjoys working with dance and in 2012 co-composed the music for Delhi Dance Theatre’s piece “Under the Tamarind Tree”. Since 2010 Asha has been studying Hindustani music on the cello under Smt. Saskia Rao de Haas. In 2012 she received the Indian Council for Cultural Relations’ scholarship to continue study under Saskia ji and Pt. Shubhendra Rao. She also teaches guitar in schools and plays piano for a choir. Asha joined Tarang in 2011 and is happy to have re-joined in 2014!